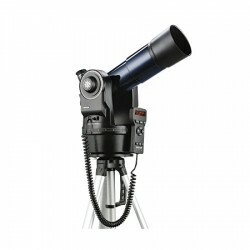 Take the Meade ETX-80BB Backpack Observatory Telescope with you and enjoy the stars, planets, or just birds. This lightweight portable telescope weighs only 12 pounds with the included tripod. Features an incredible 80mm objective lens, built-in motor, the Autostar Computer Controller system, a 9.7 and 26mm super Plossl eyepiece, dew shield, compass, erecting prism, and a backpack to fit it and all accessories.